Serve these Peppermint Dark Chocolate Coconut Macaroons to guests this holiday season! 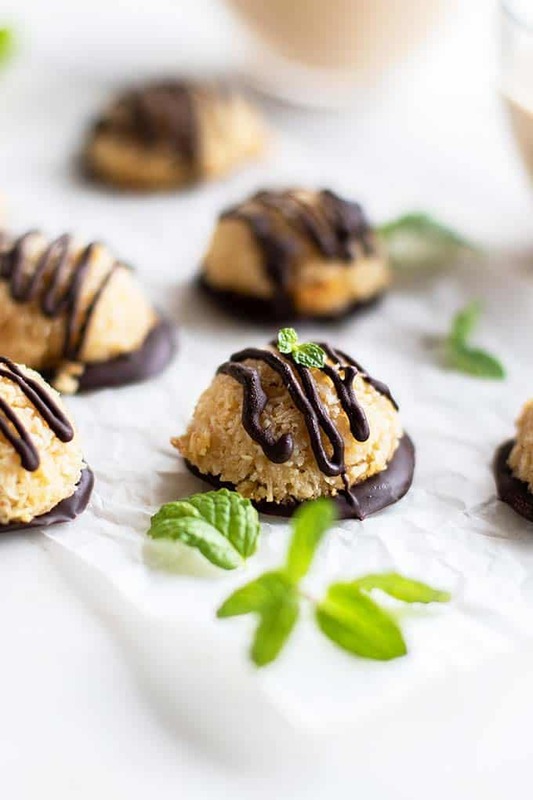 This easy coconut macaroon recipe is sure to be a hit with everyone! I’ve added my favorite flavor — peppermint — to add some additional flavor, but customize with orange, vanilla or almond flavors. 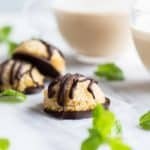 This is a Paleo and gluten free coconut macaroon recipe. *Today I’m partnering with Sharp Home USA ~ Sharp creates quality home appliances that make life easier! 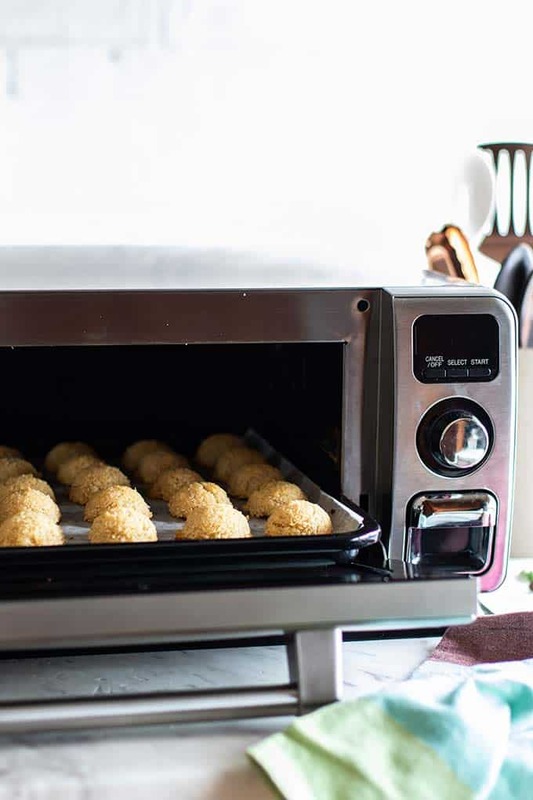 I’ve been using the Superheated Steam Countertop Oven for the past few months, and can’t wait to share how it makes cooking healthy meals easier. Thanks for supporting me and the brands I work with. I’m so excited to bring you lots of healthier holiday cookies this year! ‘Tis the season to indulge, and spoil the ones you love. Macaroons have always been a favorite cookies of mine — what I didn’t like was feeling they needed refined sugars to turn out well. This healthy Paleo coconut macaroon recipe uses egg whites and honey as the binders. The rest — coconut, dark chocolate, and peppermint extract (use pure peppermint oil for true Paleo), spice up this traditional holiday cookie. Whisk the egg whites and honey until frothy — I do this with a whisk, not a mixer, and it takes about 2-3 minutes. Add a few drops of peppermint extract, and then stir in the coconut. Using a large round cookie scoop (I use a rounded tablespoon), pack the coconut mixture into a ball shape, and place on a lined baking tray. Bake for 12 minutes in the Sharp Superheated Steam Countertop Oven! If desired, use melted chocolate to coat the bottoms and drizzle on top. This step makes them very special! PRO TIP: For a crunchier texture and deeper toasted coconut flavor, spread coconut out on a baking tray, and toast the coconut on 350 degrees for 5 minutes, until the coconut just begins to brown. Add the toasted coconut to your egg white/honey mixture. I am a huge fan of my Sharp Superheated Steam Countertop Oven. If you’re new to my site, you might have missed these holiday recipes I’ve been making this year! The Sharp Superheated Steam Countertop Oven is great for so many things. If you often are cooking for 1 or 2, or a small family, it feels wasteful to turn on an oven. The steam oven is small, but roomy inside to bake a casserole or meal for 2-3 people. It doesn’t need preheated, so it’s energy efficient. It’s also an amazing extension of my kitchen on holidays! While my large oven is busy baking the main course, I can easily prepare desserts or appetizers. The steam keeps food moist, but it still browns these cookies beautifully! I use the BAKE/REHEAT function for cookies, but when I am making fries or grilled meats, I can change it to the GRILL feature and get more color on my food. 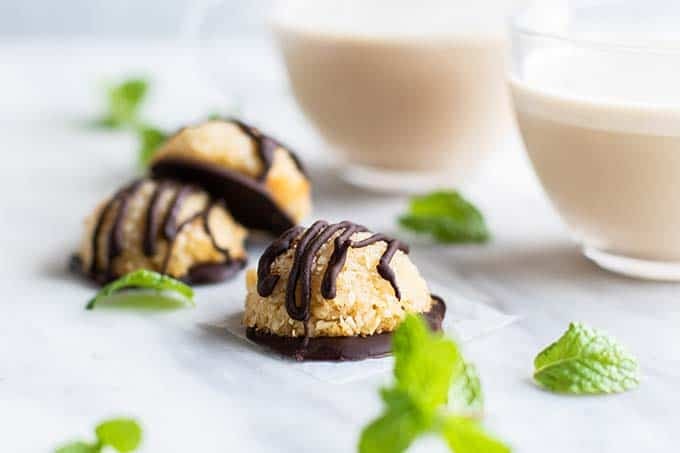 These healthy coconut macaroons are so easy to make, and only need 5 ingredients, including the peppermint and dark chocolate which are optional (in my opinion – NOT OPTIONAL!) ingredients. Coconut, egg whites, and a light colored honey are the essential ingredients. I use peppermint extract and dark chocolate chips to dress these up and make them extra special! 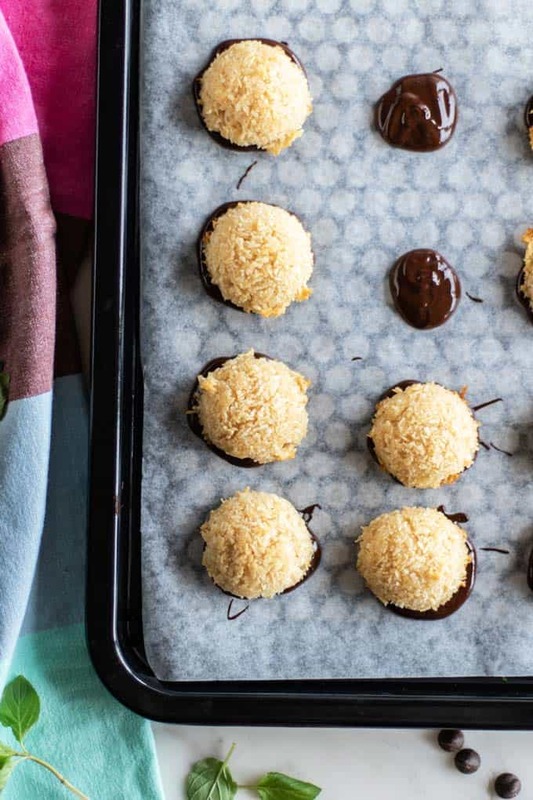 If you’re a coconut fan, these are a must-make this holiday season! To keep these Paleo, be sure to use a pure peppermint oil in place of the extract (just a drop or two will do! ), and Paleo, dairy-free dark chocolate chips. The cookies are gluten free as written! These healthier, refined sugar free coconut macaroons are the perfect holiday treat! I've dressed up a basic recipe with peppermint and dark chocolate, but feel free to sub your favorite flavor -- vanilla, orange or almond would all be wonderful additions to these delicious Christmas cookies! Add egg whites and honey to a bowl, and use a whisk to beat the mixture until it becomes light and foamy. The idea isn't to form peaks, like a meringue, but just to make the mixture very foamy. This should take 2-3 minutes. Add in the peppermint extra (or other flavoring desired), and then the coconut. Use a spoon to fully coat the coconut. 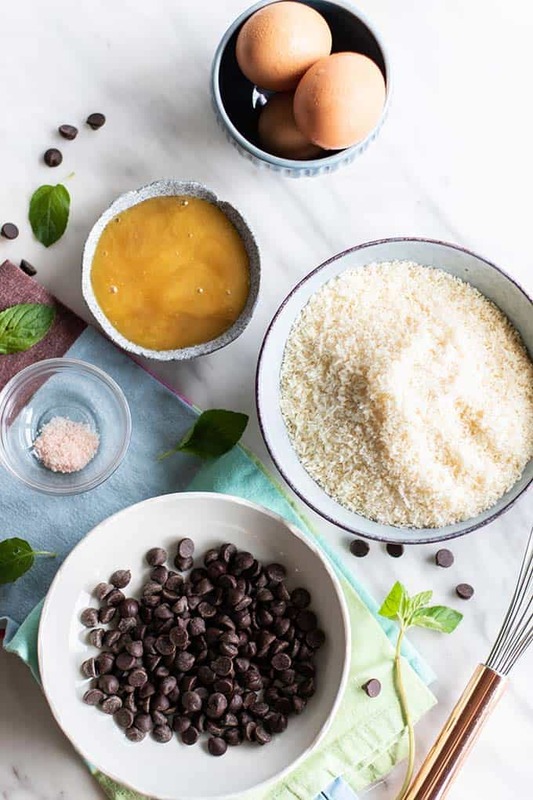 Using a rounded tablespoon or a cookie scoop, pack the coconut mixture into a ball shape, and place on a lined baking tray. This recipe makes about 20 tablespoon sized cookies. In the Sharp Superheated Steam Countertop Oven, set the oven to BAKE/REHEAT at 350 degrees, and bake the cookies for 12 minutes, until the cookies are lightly browned on top. To bake these in a conventional oven, preheat the oven to 350 degrees, and bake for 16-18 minutes, until the cookies are lightly browned. 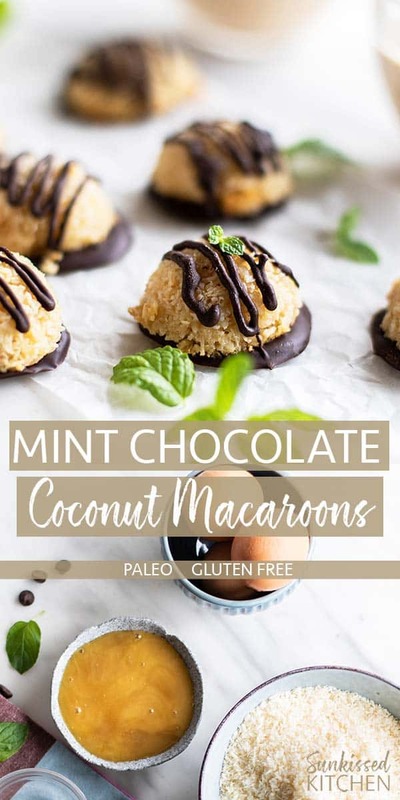 This Gluten Free Chocolate Coconut Macaroon recipe post may contain affiliate links, meaning if you make a purchase, I will receive part of the sale as a commission. This helps me continue to bring you lots of fresh and inspired recipes! I love your mint-chocolate twist on macaroons! It's one of my favorite desserts! One of my best friends is on gluten-free diet, so I'll be trying these next time she comes over. Thank you! Love that you have a friend to make these for! I adore these.